General Atomics Electromagnetic Systems (GA-EMS) announced on June 22 that projectiles with on-board electronics survived the railgun launch environment and performed their intended functions in four consecutive tests on 9-10 June at the U.S. Army’s Dugway Proving Ground in Utah. The week of test activity included marking the 100th successful launch from the GA-EMS’ 3 megajoule Blitzer electromagnetic railgun. «This is a significant milestone in the technology development toward a railgun weapon system and marks the first time flight dynamics data have been successfully measured and down-linked from an aerodynamic projectile fired from our railgun on an open test range», stated Nick Bucci, Vice President Missile Defense Systems, GA Electromagnetic Systems Group. «GA-EMS’ successful testing and on-going investment to advance our scalable railgun and projectile technologies illustrates our commitment to mature this transformational weapon system and provide the warfighter multi-mission advantages across several platforms». During the week of testing, the electronics on-board the projectiles successfully measured in-bore accelerations and projectile dynamics, for several kilometers downrange, with the integral data link continuing to operate after the projectiles impacted the desert floor. On-board measurement of flight dynamics is essential for precision guidance. The test projectiles were launched at accelerations over 30,000 times that of gravity and were exposed to the full electromagnetic environment of the railgun launch. 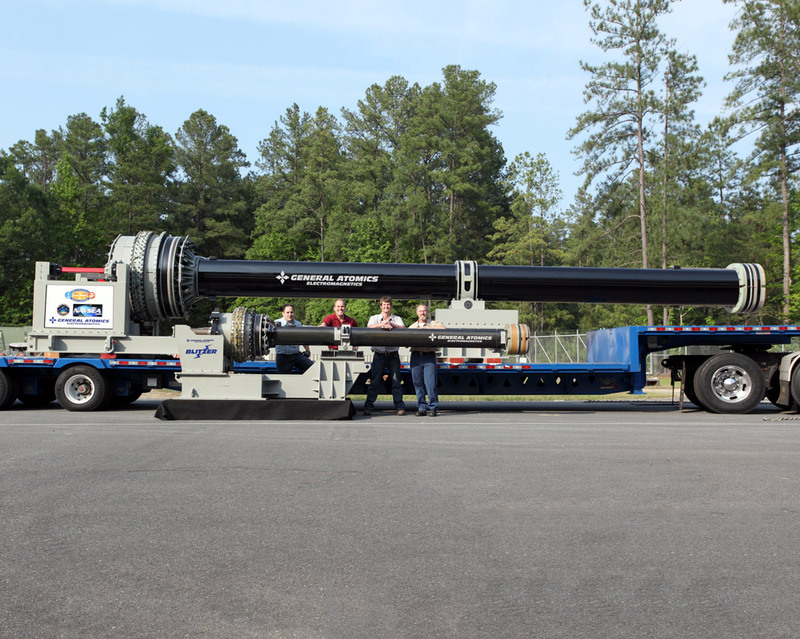 GA-EMS’ Blitzer railgun is a test asset designed and manufactured by GA-EMS to advance technology development toward multi-mission weapon systems. Railguns launch projectiles using electromagnetic forces instead of chemical propellants and can deliver muzzle velocities greater than twice those of conventional guns. Blitzer railgun technology, when integrated into a weapon system that includes the launcher, high-density capacitor driven pulsed power, and weapon fire control system, can launch multi-mission projectiles with shorter time-to-target and greater effectiveness at longer range. The Electromagnetic Systems Group of General Atomics (GA-EMS) is actively working to bring electromagnetic railgun technology to the Department of Defense for multiple missions: integrated air and missile defense, surface fire support and anti-surface warfare. GA-EMS’s expertise in electromagnetics stems from GA’s long history in high power electrical systems, from developing and building both fission and fusion reactors, through the Navy’s first electromagnetic launch and recovery equipment for aircraft carriers. GA-EMS has developed, built and successfully tested two railguns, the internally funded the Blitzer 3 MJ system and a 32 MJ launcher for the Office of Naval Research (ONR). GA-EMS also designed and built the pulse power supply for both guns and is developing projectiles for air and missile defense and precision strike. GA-EMS is continuing the Blitzer family of railguns with a 10 MJ system designed for mobile and fixed land-based applications. Railguns deliver muzzle velocities up to twice those of conventional guns, resulting in shorter time to target and higher lethality at greater range with no propellant required onboard the platform. Railguns offer much deeper magazines and lower cost per engagement compared with missiles of comparable range. 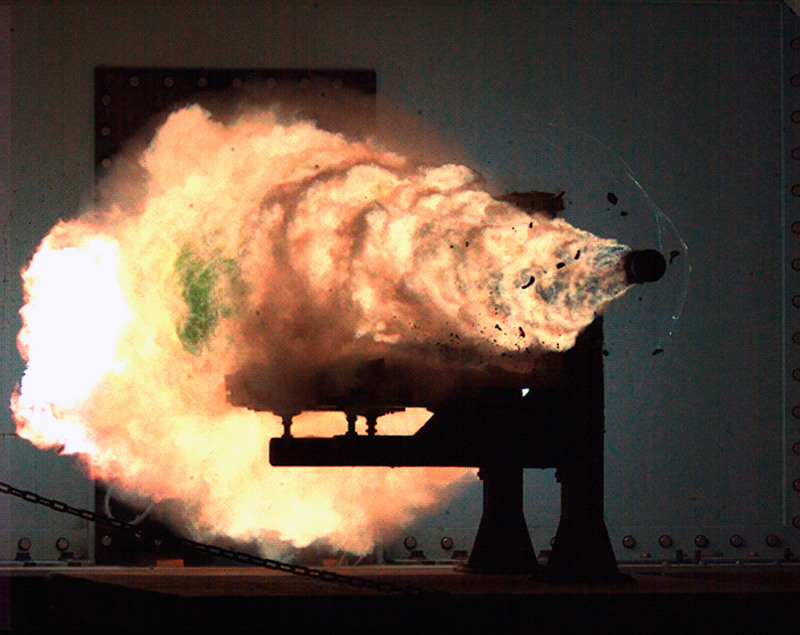 Railguns can reliably launch projectiles to muzzle velocities of Mach 6-7+. A round fired at sea level can reach the horizon in 6 to 7 seconds and still be traveling faster than a conventional gun‑launched munition at its muzzle. Hypervelocity impact achieves high lethality through kinetic energy, eliminating the safety and logistic burdens of explosives. Railgun weapon systems employ guided, maneuverable projectiles, which can accomplish multiple missions with the same round. Railguns can also fire a family of different projectiles with varying capabilities, levels of sophistication, and cost. Because rounds are launched electromagnetically, propellant is not required. This results in much smaller rounds, enabling many more stowed rounds in a constrained volume as well as improved safety and reduced logistics burden. The confluence of microelectronics, nanotechnologies, and electromagnetic acceleration enable missile performance without rocket motors. Railgun-launched guided projectiles are expected to be much lower cost than current assets for integrated air and missile defense. With deep magazines and high, sustained firing rates, railguns provide unprecedented firepower. The lower cost and higher firepower of railguns levels the playing field with potential adversaries.